Inman Park is an intown neighborhood on the east side of Atlanta, Georgia, and its first planned suburb. It was named for Samuel M. Inman. The area was part of the battlefield in the Battle of Atlanta in 1864. Inman Park (proper) was planned in the late 1880s by Joel Hurt, a civil engineer and real-estate developer who intended to create a rural oasis connected to the city by the first of Atlanta's electric streetcar lines, along Edgewood Avenue. The East Atlanta Land Company acquired and developed more than 130 acres east of the city and Hurt named the new suburb for his friend and business associate, Samuel M. Inman. Joseph Forsyth Johnson was hired as landscape designer for Inman Park who included curvilinear street designs and liberal usage of open spaces in his planning. High up above the city, where the purest breezes and the brightest sunshine drove away the germs of disease, and where nature had lavished her best gifts, the gentlemen who conceived the thought of Inman Park found the locality above all others which they desired. It was to be a place of homes, of pretty homes, green lawns, and desirable inhabitants. And all save those who would make desirable residents have been excluded. ... It's the prettiest, highest, healthiest and most desirable locality I ever saw. Everybody is friendly and neighborly. ... And as far as accessibility it ranks second to no residence portion of the city. We have three car lines and frequent schedules. Like new developments throughout the United States at the time, but in stark contrast to the attitudes prevalent in the neighborhood today, Inman Park was conceived of and promoted as a segregated community. Moreland Park was by contrast developed as a more traditional, incremental building of sub-divisions as opposed to the grand plan for Inman Park proper. The arrival of the automobile allowed upper class Atlantans to live in suburbs farther north from downtown workplaces, such as Morningside and what is now considered Buckhead. Inman Park became less fashionable and the exuberant Victorian architecture came to seem dated. The mansions came to be subdivided into apartments. an economically depressed neighborhood of mostly blue-collar white folks, elderly couples who could not afford to move out and families on disability and welfare. They lived in rented bungalows or big houses chopped up into tiny roach-infested apartments. Driving through the neighborhood on his way to appraise stained glass windows in the doomed home of Judge Durwood T. Pye on Poplar Circle, Robert Griggs was smitten by the extraordinary architecture of the Beath-Dickey House, then a dilapidated multi-unit rental property. He and his partner, Robert Aiken, bought the house and restored it to a single-family dwelling. They were followed by others who restored homes; founded Inman Park Restoration, the neighborhood association; and created a neighborhood newsletter, a garden club to rehabilitate public spaces, and a pre-school. To publicize the progress they were making, they began a Tour of Homes with a small festival, which has grown into the hugely popular Inman Park Festival, held each spring. During this same period, there was an intense fight against the I-485 freeway which was to be built through the neighborhood, although many properties in Inman Park, as well as the entire neighboring neighborhood of Copenhill, were torn down in preparation for freeway construction. 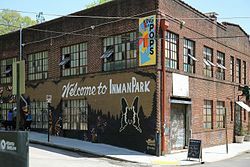 After decades of restoration and renewal, Inman Park is now regarded as a highly desirable intown neighborhood with a mixture of rental and owner-occupied houses and condominiums. Built up as it was over decades, the neighborhood housing now ranges from tiny mill town shotguns to the Victorian mansions of the original development, intermixed with bungalows of all sizes built during the first three decades of the 20th century. Like its housing, the makeup of Inman Park has changed since its inception, with a population that is 25% non-white and of varying economic levels—although increasing housing prices are beginning to force more economic homogeneity. Since the beginning of its renewal, inclusivity and a strong sense of community have distinguished Inman Park. The neighborhood association has always welcomed renters and homeowners alike, with nominal annual dues, while the Inman Park Festival, which attracts tens of thousands of visitors every spring, brings residents together to produce the largest all-volunteer festival in Georgia. The Festival's centerpiece is the Tour of Homes, which showcases the wide variety of sizes and types of residences in the neighborhood. Former industrial areas on the west side of the neighborhood have been redeveloped into mixed-use complexes. The former General Pipe and Foundry site is now North Highland Steel and the Mead paper plant site is now Inman Park Village. In the early 1990s the former Atlanta Stove Works was transformed by swapping 2 letters of its name and became the Atlanta Stage Works, a film and media production center, that eventually housed the early Tyler Perry Film studios and the National Aids Quilt. In 2015 it was converted into a mixed-use office and restaurant space, which will now be added to the space across Krog Street to form the Krog Street Market. Little Five Points district is located where Inman Park and Candler Park meet at Moreland Avenue and Euclid/McClendon. Inman Park contains Atlanta's best collection of residential architecture from the late 19th and early 20th centuries. Styles include Queen Anne, high-style Italianate and Romanesque mansion as well as smaller bungalows, shotguns, and foursquares. Inman Park was Atlanta's first example of a garden suburb, with great attention paid to street layout, parks and other public space, and would inspire other Atlanta garden suburbs such as the Frederick Law Olmsted-designed Druid Hills. There are two historic districts within the Inman Park neighborhoods: the Inman Park historic district, and the Inman Park-Moreland Historic District, originally the separate suburb of Moreland Park. The Krog Street Tunnel under the CSX Railroad connects Inman Park with Cabbagetown and is famous for street art. Edgewood Avenue in both Inman Park and Old Fourth Ward is a restaurant street that has been gaining acclaim especially since 2013. Highland Avenue connects Inman Park to the Poncey Highland and Virginia Highland neighborhoods. The Highland Avenue corridor offers dozens of local restaurants and shops. Parks in Inman Park include Springvale Park, a pet project of Joel Hurt and designed by the Olmstead Brothers. Part of Freedom Park lies in the neighborhood, which the BeltLine trail also borders. There are also smaller parks: Delta Park, Inman Park, the park in Inman Park Village, and the Bass Recreation Center. Inman Park is in NPU N. Neighbors participate in the Inman Park Neighborhood Association (IPNA). Inman Park residents are served by Atlanta Public Schools. MARTA runs bus service and rail service. The Inman Park / Reynoldstown MARTA station is located at the south end of the neighborhood. ^ The original NRHP listing was as "Inman Park" but the boundary increase renamed it to "Inman Park Historic District" in the NRHP. ^ Bazemore, Ted (September 12, 2007). "Inman Park". The New Georgia Encyclopedia. Retrieved 27 December 2010. ^ "Bruce Forsyth". Who do you think you are?. BBC. Retrieved 28 December 2010. ^ Communications, Emmis (1 October 2005). "Atlanta Magazine". Emmis Communications. Retrieved 16 April 2018 – via Google Books. ^ Marr, Christine V.; Jones, Sharon Foster (2008). Inman Park. Charleston, S.C.: Arcadia Pub. p. 101. ISBN 978-0-7385-6731-0. 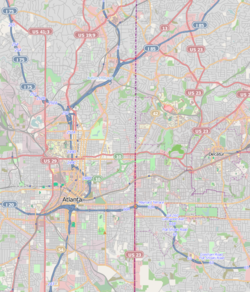 ^ "Race and Ethnicity in Atlanta-Inman Park, Atlanta, Georgia (Neighborhood)". Statisticalatlas.com. Retrieved 26 August 2015. ^ "Inman Park--Moreland Historic District--Atlanta: A National Register of Historic Places Travel Itinerary". Nps.gov. Retrieved 16 April 2018. Wikimedia Commons has media related to Inman Park, Atlanta, Georgia. This page was last edited on 19 April 2019, at 13:44 (UTC).